Fear of loud noises is a common phobia in dogs and cats, especially with thunder and fireworks. In dogs, it is usually displayed by hiding, whining, barking, pawing or even urination. Trying to help your dog cope with loud noises is important because the anxiety usually gets progressively more pronounced with age. A dog suffering from a fear of thunderstorms may begin to display anxious behavior before the thunder begins. It is important not to punish your dog for being anxious, but equally important not to cuddle too much. Cats usually display fear by hiding. A cat suffering from a substantial fear or loud noises may begin to display anxious behavior before the thunder begins. Rain on the roof of the house, bright flashes of light or even the drop in air pressure before a storm may be enough to trigger anxiety in both dogs and cats. In dogs, if you punish them it will just create more fear and anxiety because thunder will then be associated with both fear and punishment. Cuddling or comforting your dog too much isn’t a good idea because it teaches them that anxious behavior is appropriate. Instead, first provide your dog with a safe place to seek refuge. Dog crates, under a bed or under a chair are common hiding places for a dog. Your dog chooses these places because she feels protected and the noise is muffled. If your dog has not already picked out a place, provide one. Try leaving a few treats in a safe place to encourage your dog to go there. Try desensitizing your dog to loud noises so the sound becomes normal. This is usually done by playing recorded thunder or fireworks at a low volume and in short intervals while you monitor your dog’s behavior. Try to distract your dog while the noise is present by playing catch or engaging in some sort of enjoyable activity. If your dog is too frightened to participate, you need to turn down the intensity of your thunder stimulus and try again later. This process is long and requires patience, but in the end your dog will be much more comfortable during a storm. In cats, staying calm will help them feel safe. You might even try to play with them to distract them from the noise of thunder or fireworks. 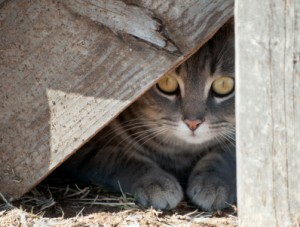 Make sure your cat has a safe place to seek refuge. Cats typically will run under a bed or under a chair to escape loud noises. Your cat chooses these places because she feels protected and the noise of thunder or fireworks is muffled. If your cat has not already picked out a place, provide one. Try leaving a few treats in a safe place to encourage your cat to go there. Try desensitizing your cat to loud noises so the sound becomes normal. This is usually done by playing recorded thunder or fireworks at low volume and in short intervals while you monitor your cat’s behavior. This process is long and requires patience, but in the end your cat will be much more comfortable during a storm or near a fireworks display. In extreme cases, your veterinarian may prescribe a mild tranquilizer to help your pet cope during prolonged or especially loud times. If you have questions or concerns, please contact us here at Upper Valley Vet Clinic. We are happy to work with you and your pet. If you are a new client and are looking for the best care for your pet, be sure to print a savings coupon and bring it with you at your first visit.